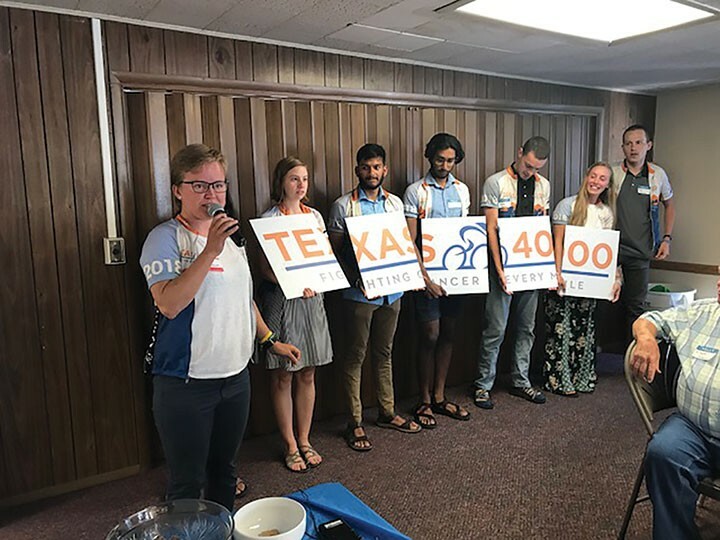 July 14, 2018 — On July 10, about 3:30 p.m., the Texas 4000 Bicyclists arrived in Florence. No — not 4000 bicyclists, but 24 bicyclists representing the University of Texas — Austin, Texas 4000 Ride For The Cure organization. This is the 13th year that Florence has been able to host this wonderful group of young people as they pedal their way from Austin to Anchorage, Alaska. This stop represents day 39 on their 70-day schedule. As in years past, the riders were guests in the homes of many hosts in the Florence area, where they enjoyed the fun of doing their laundry, interacting with our community, and having a good night’s rest. But prior to this, all of the riders, hosts, cooks and crew gathered at St. Andrew’s Episcopal Church for a huge “Thanksgiving In July Feast” of turkey, ham, mashed potatoes, gravy and all the trimmings, followed by the individual introduction of the riders and their goals. Following the Wednesday morning breakfast, the riders did their traditional “Circle of Commitment” for the day’s ride. By 8:30 a.m., they were on the road, next stop Lincoln City. As you can imagine, getting this all to happen requires the work, commitment and skills of many, many people. In addition to the St. Andrew’s staff, cooks, kitchen crew and hosts, this year featured the assistance of four Siuslaw High School students — Brendon, Jaxsen, Camp and Caelia — along with Sheila and Ricki, making this truly a communitywide effort. This is noted most by the riders themselves when they comment that they really want to come back here and visit in the near future. A very special thanks to Sea Lion Caves and Coastal Fitness for their support. Read the original article by Terri Pennington HERE.